"Caleb asks every morning....Is it Kindermusik today? He just loves it"
Kindermusik Laugh & Learn takes the preschooler on a musical journey of discovery and exploration…a journey limited only by the power of imagination. Pretend play activities are integrated with music, vocal development, storytelling, movement, and literature to capture the preschooler’s potential to learn and to encourage cognitive and literacy skills, creativity and individuality. Designed for active, energetic, enthusiastic, and imaginative children ages 3 to 5, Laugh & Learn classes encourage socialization, sharing, and participating in group activities. Singing becomes a focus for enhancing the preschooler's vocal development as expressive language is just beginning to emerge. The parent and child have fun participating together in the last 10-15 minutes of class during Sharing Time, where they'll also learn about Home Activities they can enjoy together throughout the week. His blanket becomes a superhero’s cape. A cardboard box doubles as her princess castle. Pots and pans become a drum set. And she sings all the time. Sound like someone you know? Every day brings a new discovery for the preschooler—slowly opening the doors of individuality and independence. 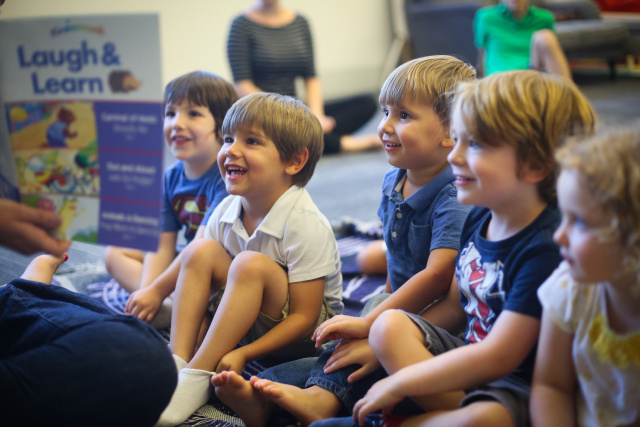 Using the power of music, Kindermusik’s Laugh & Learn taps into the preschooler’s creative spirit and boundless energy and focuses on developing learning strengths and self-confidence so he’ll be ready for school, prepared for future music lessons…or able to leap tall buildings. Pretend Play Pretend play activities are integrated with music, vocal development, storytelling, listening, movement, and literacy aspects of each class. When based upon a child’s real life experiences, pretend play helps develop language, sensory, motor, and cognitive skills. Musical Variety and Singing Activities include a mixture of musical genres and styles and provide a setting for children to explore their many voices and to use a “singing voice.” Singing helps with memory and recall, physical development, creativity, and socialization. Storytelling and Literacy Each class is built on the development of a story, so you’ll hear preschoolers search for the word to say what they mean and try to keep up with their busy minds, emerging wants, needs, likes, and dislikes. Parent Involvement Preschoolers are learning to be self-sufficient in a group setting of peers, while many times still needing the emotional security provided by a parent. The preschooler experiences both. Caregivers participate in the last 10-15 minutes of class. Plus the At Home Materials ensures the learning continues at home with each child’s best teacher—the parent!